Shaken By Protests, Venezuela Sees Casualties Mount As Showdown Deepens : The Two-Way For more than six weeks, demonstrators have taken to the streets against President Nicolas Maduro. But even as the number of deaths passes three dozen, neither side is indicating it will back down. 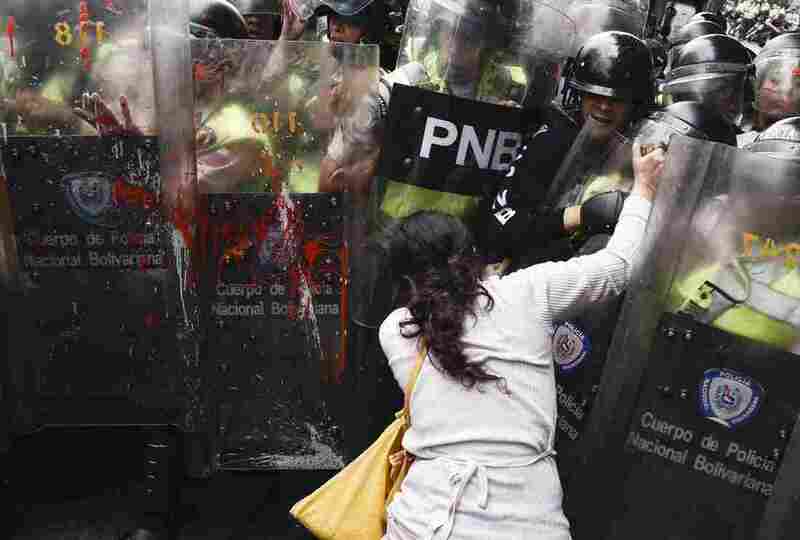 A protester pushes into a phalanx of riot police Friday in Caracas, Venezuela. Demonstrators blame President Nicolas Maduro for the country's economic crisis, food shortages and indefinitely delayed elections. More than three dozen people have died in a month and a half of protests. An inflation rate projected by the International Monetary Fund to hit 720 percent this year. A food shortage that, according to a poll cited by The Wall Street Journal, has partly resulted in 3 out of 4 Venezuelans reporting involuntary weight loss last year, by an average of 19 pounds. A growing list of detained protesters, which, by The Associated Press' count, stretches up to 2,000. Still, few statistics stand out more than the number of people killed or injured in the protests since they began in earnest at the end of March: more than three dozen killed and more than 750 injured, according to the AP. Other news agencies, such as Reuters, report that more than 40 people have died from injuries related to the demonstrations and the police response. That includes at least four people who died from wounds they sustained Monday in the states of Tachira, Barinas and Miranda — including 31-year-old Diego Arellano, whose death was announced by opposition leader Henrique Capriles. The protesters, which for weeks have called for the release of political prisoners and the resumption of indefinitely delayed elections, clogged the streets of several cities Monday morning with a sit-in directed against Maduro. These demonstrations opened peacefully, the AP reports, but eventually descended into the chaotic clashes between activists and riot police that have characterized the recent weeks of unrest. By day's end, several members of the security forces had been injured, and the BBC notes that the offices of the state-run power company, Corpoelec, had been set aflame in Carabobo state. 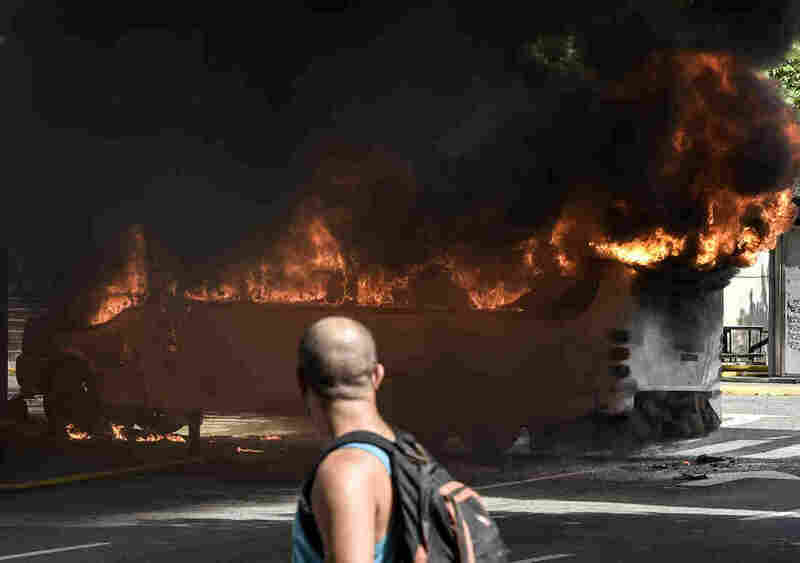 A man stares at a burning bus in Caracas on Saturday. Hundreds of people have been injured in the weeks of near-constant clashes between protesters and police. The British news agency reports that Maduro blamed activists for the destruction and accused opposition lawmaker Julio Borges of inciting further violence. Others, such as the European Union, have been less inclined to blame the violence on the opposition. Rather, in a statement released Monday, the international organization declared that "fundamental rights of the Venezuelan people must be respected, including the right to peacefully demonstrate. It is crucial that all parties refrain from violent acts." "The release of jailed political opponents and the respect of the constitutional rights of all political actors to vote and to participate in elections are also crucial steps to building trust and helping the country to regain political stability," the EU added. 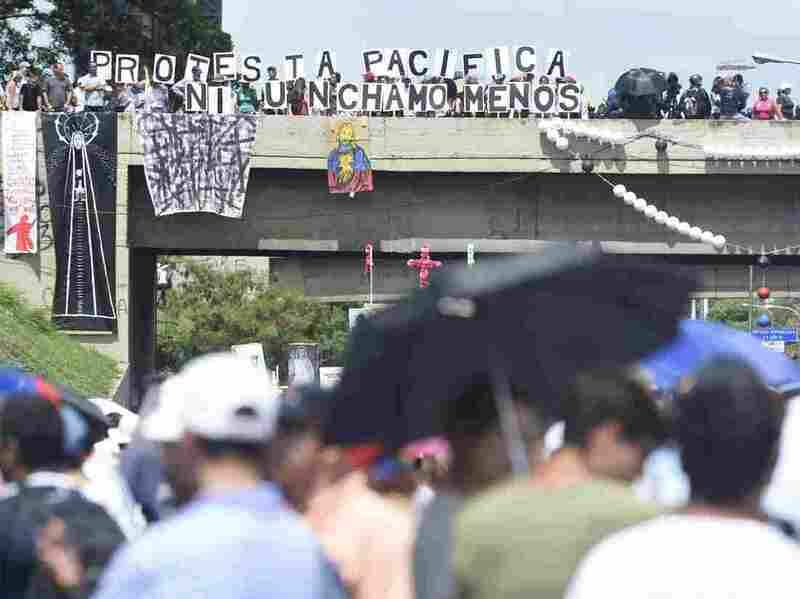 Protesters display signs from an overpass Monday in Caracas as they call for Maduro's ouster. The president blames the unrest — and the economic troubles that helped inspire it — on foreign powers like the U.S. Still, Maduro has shown no indication he will back down to external pressure. In fact, after the Organization of American States criticized his response to the unrest late last month, his government initiated steps to withdraw from the Washington-based group — which, if Venezuela follows through, would mark the first time a country has left the OAS. 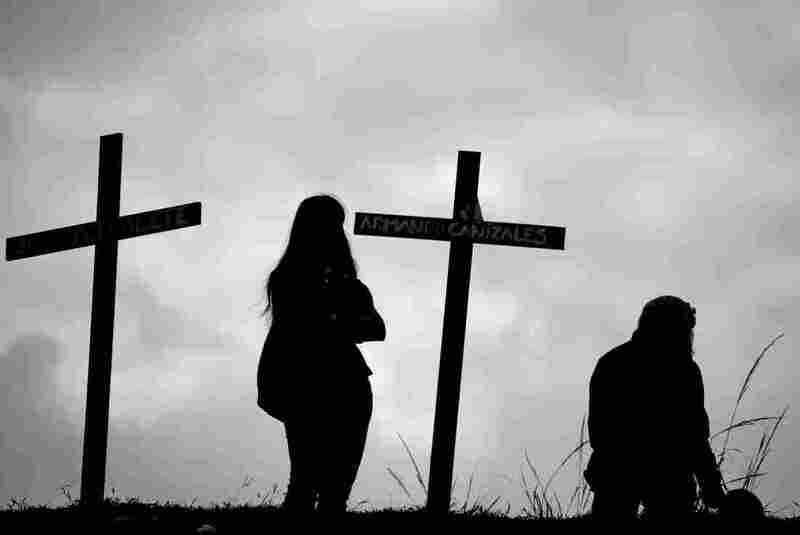 He maintains that the unrest — and the economic troubles that helped inspire it — has arisen at the prompting of foreign powers like the U.S.
Venezuelan opposition activists set up crosses Monday in Caracas to commemorate those who have died in the protests against Maduro. Maduro's fate ultimately might not be decided by forces beyond Venezuela's borders or by demonstrations within them, so much as by another party: the military. As NPR's Philip Reeves reports, Maduro has long sought to build up loyalty in the ranks by naming new generals and meting out business interests. But if that loyalty falters — as it has appeared to have lately among the poor, his party's longtime base of support — some believe the situation could change in a hurry. "Right now, I'd say this very weak government is utterly dependent on the military," Phil Gunson, a Venezuela specialist with the International Crisis Group, tells Reeves. "If the army stops obeying orders, then the government I think would fall quite fast."